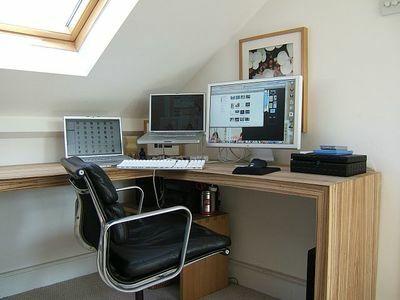 Perhaps the most important aspect of setting up a home office is considering the space you have available. A home office does not necessarily have to be ample; it only needs to serve its purpose. This being said, it is crucial to make the most out of your space and create a fully operational office. Your office should be designed in a way to boost your overall performance and to motivate you to do your tasks more efficiently. The ambient plays a huge role here. The best you can do is to create a relaxing ambient that is suitable for you by choosing a serene colour palette and allowing sunlight into your office. Your surrounding is responsible for how your work will be performed, so focus on creating the most comfortable one. One of the true characteristics of a well-designed office is managing your supplies and documents. Having adequate storage space can greatly contribute to the complete ambient in the room. 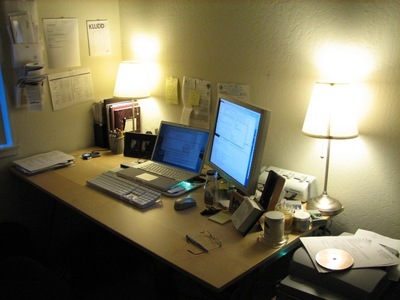 Creating a clutter-free environment will surely boost your performance and help you conduct your business properly. File cabinets, lockers and drawers are a great way to store all of your important files and documents. If you are tight on space you can always consider having built-it cabinets which are quite useful as they can easily maximize the space you have available. Most people have a difficult time keeping all of their office supplies in order. Keeping things organized is a crucial part of conducting business, as it helps you keep an organized mind. Fortunately, you can easily reuse some old kitchen objects like muffin trays and jars to hold your supplies or use your artistic skills and create dividers, folders and files organizers using only a piece of wood and leather. Binder clips do a wonder at keeping your cables untangled and peg boards are a simple and yet effective way to use your wall space . Do not hesitate to reuse our old shoe boxes or see-through containers to organize your files. Also, colours and labels are a great way to create an organized office space. Sitting all day in front of the monitor could really take its toll after a fair amount of time. This is why experts who make office furniture in Sydney recommend using only ergonomic pieces of furniture which are designed to conform to your body and reduce possible injuries like back and neck pains and posture problems. This is why it is important to invest in creating a quality workstation that will suit all your needs and boost your overall work performance. A productive environment is one of the key factors when it comes to performing your duties more efficiently and effectively. Designing a custom home office that will be suitable for your needs is the first step towards a lucrative business. These few tips will surely help you get the most out of your home based business.